For many years I grow passion flowers. This year especially a plant of P. mixta gives me a lot of joy. 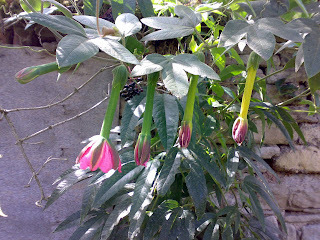 It is a tacsonia, a group of passion flowers that grow in higher altitudes in the Andes in South America. Its seed sprouted in February last year and from the beginning it was fast growing, a beautiful plant. It dropped the first flower buds, which appeared in July- to my utter disappointment! But in August the first flower opened and from then on many, many more. Actually it is difficult to grow tacsonias here in Germany and hard to get them in bloom, but this one is really very free flowering. Though it hides a lot of its beauty, because the flowers do not open fully and remain bell-shaped and hang down when open. Only the buds are held horizontally. 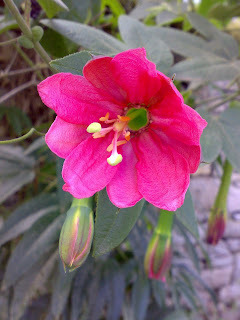 You have to lift the flower or look from the ground to see the amazing coulor.